Who says glamping is just for summer? This is something we hear a lot, but what could be cosier than snuggling up with a hot water bottle and blanket, log burner roaring and the gentle sounds of the outdoors outside the canvas walls. Far from a wind blown, rain soaked, self-constructed tent, we line our Mongolian yurts with an extra layer of sheep wool felt in these chillier months, and we prepare each yurt with a hot water bottle and extra blanket! Perfect for getting cosy after a day of rambling in the crisp country air. 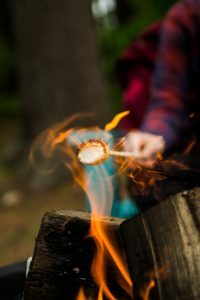 And, our fire pits are great for toasting marshmallows while cupping a mug of hot cocoa. 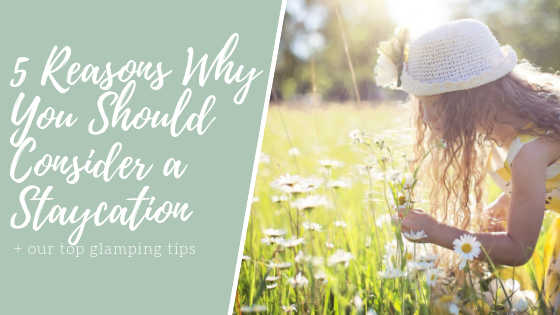 It can feel harder to get your nature fix during the winter months, as the dark nights draw us to stay indoors with a hot meal, glamping however, offers warmth and comfort whilst being surrounded by nature. You can even get a steaming bowl of freshly prepared soup from our Canvas Café if you’re craving hot comfort food. Astronomers refer to the autumn, winter and spring months as ‘observing season’, as the best star gazing can be found from the time the clocks go back in October until the time they go forward again in March. 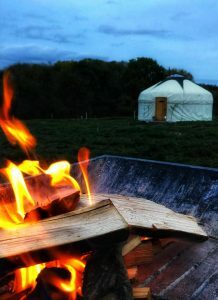 So whether you prefer to view the stars through the wheel crown roof of your yurt, or take in the full expanse of the sky from beside the outdoor fire pit, you can make the most of the dark nights. 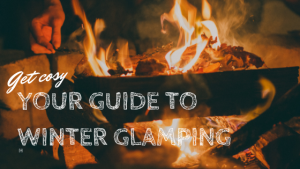 No winter glamping experience would be complete without the log burner crackling away inside your yurt or without a firepit to sit by in the evening. If you are yet to become an expert fire maker we are happy to offer a helping hand. As the old wives tale has it, breakfast is the most important meal of the day, and porridge is one sure fire way to kick any chill, so start your day right with a warming bowl of porridge in our Cavas Café. Allowing hot water to soak through your skin as you gaze at the stars and feel fresh air around you is the ultimate indulgence. Watching the wood fire begin to crackle and heat the water makes the relaxing final experience even more rewarding, as does the peace of mind that comes with knowing your spa indulgence is eco friendly and carbon neutral. No winter camping trip would be complete without a fuzzy pair of socks! And really, does anything feel more comforting than putting on a pair of soft, fluffy socks, particularly after a day filled with walking and country activities. Book before the end of December for our 2019 Early Bird offer. 10% off your 2019 glamping break when you book online in December 2018. Enter discount code DECEARLYBIRD.